Jump! was recorded on various locations during the 1992 US tour. 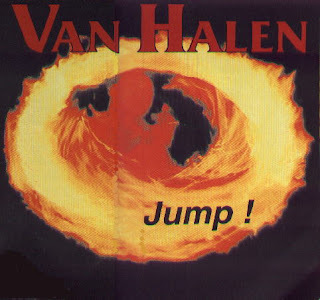 Tracks 4 and 10 are mixed with the others but it's not VH performing, its believed to be Sammy Hagar, Michael Anthony, Craig Chaquico and someone on drums. These are from a show at the Cabo Wabo Cantina in May of 1992.
i'm almost sure track 4 and 10 are from a live radio show from cabo wabo in 92 with a band jam with the following: sammy,michael,craig and david louser on drums.i recorded some of this onto tape from the radio back then. tracks i have are: crossroads, heavy metal,rock candy and rock n roll.other tracks were played too. also playing acoustic was bret and richie kotzen from poison-who also was in the band jam for some tunes. later sammy joined them for a acoustic blues jam. after the jam,a live van halen show was played from around that time.not from the "right here right now" cd. as always,thanks for all the great tunes you put up! Thank you for all the information you gave. Some of these 'releases' are really strange, who would have thought of putting these tracks mixed with the others? !